It is quite simple, please read on . . . . The breakdown shows the interconnectedness of the two classes of entities in the universe through a single space density continuum and the universal master code. June 17-21, 2007 at Boise Center, Boise, Idaho. The paper introduces the relationship between mass and space occupied by the mass, based on the concept of a property of space called density. It is crucial for the student to fully understand the anatomical structures within the framework of the cerebro-spinal complex, where conscious influences are directed during the practise of the discipline. See the Instruction section to get started. A reference book on human anatomy will serve as a good companion for the serious student. The former captures space while the latter displaces spac. These facts give rise to the notion of "density" associated with both, Dyau and Prithvi spaces. The key nervous plexuses (indicated by black circles in the diagram) are space bodies of a specific (quantized) density. There are five (5) of them between the Coccyx bone and the two-lobed cerebellum on the spinal column. ProBiotic Space Sciences offers procedures to manipulate the density of these space bodies through vibration techniques. The objective is to match similar quantized space density volumes in free space outside the body. This is referred to as a "Cantilever Effect". It is a spontaneous event with real visual effects and a state of ecstasy for the meditator. They appear in the Antariksha space outside the body, where the quantum effect occurs. They are visible as three or four, multicolored vortices (about half a centimeter long) around a dark trapezoid, usually, in front of the right eye, turning in the anti-clock direction. They are visible for as long as ten seconds, even when you pass your hand in front of your eyes. Remarkable insights are achieved through this procedure. 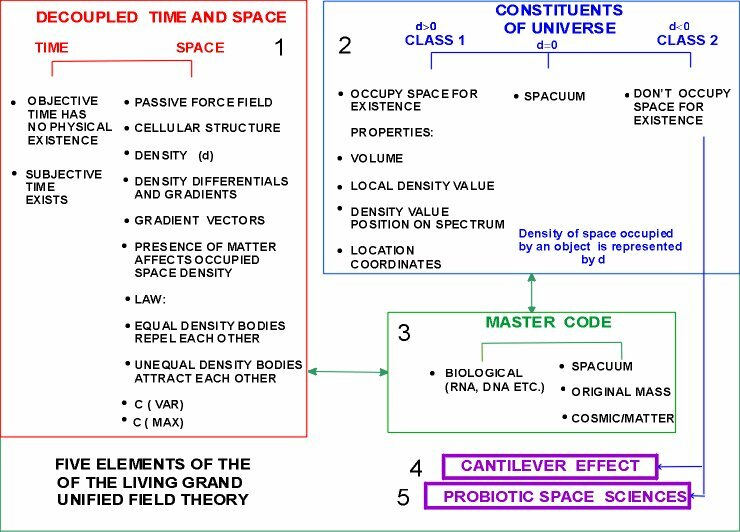 The overview above, shows the visible and invisible sites in the human anatomy, where key processes related to the physiology involved in the practise of the discipline of Probiotic Space Sciences are centered. A: The spinal cord running in the core (spinal canal) of the vertebral column is the principal neural pathway. The cord itself is divided into sectional nerve tracts of gray and white matter for the afferent and efferent current flow in ascending and descending (to and from the centers in the brain) directions. Several features of the cord play key roles in the Probiotic Space physiology. 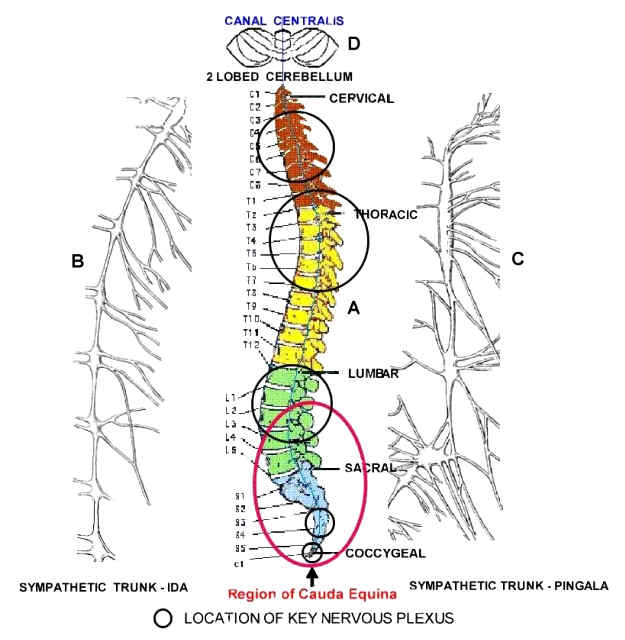 Canal Centralis: Invisible to the naked eye, the minute canal connects the fourth ventricle in the central brain to the lower region of Cauda Equina, running through the full length of the cord. Cauda Equina: Running down from the brain, the cord terminates below the nerve L2 junction in the Lumbar region into a cone from where a long slender filament (filum terminale) descends through a mass of nerves of the region to the base of the coccyx (tail) bone. Five main trunk plexuses - two inside the Cauda Equina, three outside along the cord form densely populated nerve centers with multiple connections. Represented by circles in the diagram. B: The Sympathetic Nervous trunk along with several gangliated plexus running from the base of the skull to the coccyx (tail) bone on the left side of the axis (IDA). C: The Sympathetic Nervous trunk along with several gangliated plexus running from the base of the skull to the coccyx (tail) bone on the right side of the axis (PINGALA). D: Two laterally-lobed structure called cerebellum fans out on either side and fore of the axis (AJNA). Canal Centralis does not pass through it. The neurons of the brain and the structures highlighted above are electrically charged circuits with heavy pulse activity in a three-dimensional environment. In and around the plexuses, envelopes of force-fields proportional to the density of nerves within a plexus are continuously generated. The expanding and contracting field fluxes act like a sub micro-volt level electrical generator creating secondary and tertiary electrical activity in neurons within reach. This activity gives rise to a discernible volumetric pocket of 'hollowness' within the body of the plexus (soonya). The two sympathetic trunks have a linear bias with concentrations of volumetric fluxes centered around the plexuses and ganglia located on them. The net result of the interactions culminates in a subtle clockwise and anticlockwise 'feeling' in the two trunks which is discernible at the fixed locations of the five plexuses along the axis. It can be consciously manipulated for a desired effect. Nostril dominance in the breathing cycle is quantifiable by three parameters, namely, volumetric efficiency, inside skin potential and oxygen-carbon dioxide composite at expiration. It is postulated that nostril dominance is related to the direction of the 'feeling' generated along the axis. The role of the Canal Centralis is to provide a channel of control and manipulation under the conscious control of the practitioner through the variety of prescribed steps detailed in methodology and procedures section of the paper.